WrisTimer Wrist Support provides therapeutic treatment during the day. 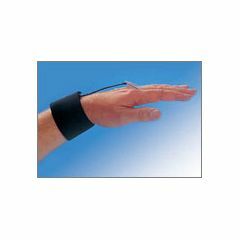 Finger and hand free design allows a healthy range of motion and avoids damaging wrist flexion during work or activity. Elastic wristband adjusts easily for stable and comfortable wrist compression while the finger loop adjusts for the desired range of motion. Designed by an orthopedic surgeon, WrisTimer is an ideal dynamic support for occupational use. Used by leading companies for prevention and rehabilitation of carpal tunnel sydrome and other repetitive stress injuries, research studies show preventing damaging flexion while allowing a healthy range of motion during activity is desirable. Use for repetitive stress injuries, post-op rehab, carpal tunnel syndrome and prevention of potentially damaging flexion during activity. WrisTimer PM is the perfect companion support to use at night. Easy to use - flexible. This brace is the BEST and I have used this type for over 10 years - allows wrist and hand to be flexible, yet at the same time prevents carpel tunnel from worsening. Also helps to use during times of flare-ups in the condition. I use it both professionally and personally. I can wash my hands while the brace is on without getting it wet (an extra plus). I have let other people borrow it to try it's effectiveness, and 100% of the time they are amazed at how good it is and have purchased the brace themselves. Do yourself a favor and try it. I use it during the day around the house. My main problem is twisting motion of the wrist , or holding while the other hand twists (jars, for instance). This works to help prevent that (or remind me not to!). I have found that it does what it is supposed to do---so far.